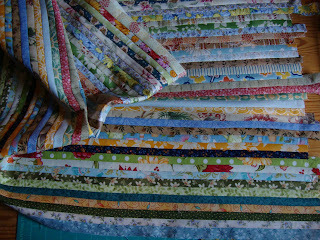 This is the only thing I made for FNSI - the start of a piano border for my mothers quilt. I do hope it will be finished for Christmas. Well I guess if I focus on that, then it will. Your border is so pretty! So many different fabrics make is so scrappy and lovely! Should be beautiful as a border! That is looking lovely.. love all those colors ! She's going to love it.